Jean-Marc Nattier (1685–1766), Perseus, Under the Protection of Minerva, Turns Phineus to Stone by Brandishing the Head of Medusa (date not known), oil on canvas, 113.5 × 146 cm, Musée des Beaux-Arts de Tours, Tours, France. Wikimedia Commons. Ovid concluded Book 4 of his Metamorphoses at the wedding feast of Perseus and Andromeda, and it is there that he opens Book 5. Perseus has just finished his stories of how he beheaded Medusa, and how Medusa came to have snakes in her hair in the first place. It’s at this point that the wedding feast gets out of hand – just as they always do in fiction. As Perseus is completing his stories about Medusa, the palace is invaded by a rabble. Its ringleader is Phineus, the brother of King Cepheus, wielding a spear, who quickly establishes that, as far as he and his mob are concerned, Perseus has stolen his bride (who is also his niece). With a quick dig at Perseus’ conception by Danae with Jupiter’s ‘shower of gold’, Phineus and Cepheus argue. Phineus then hurls his spear at Perseus, only to embed it in the furniture. Perseus throws it back, but Phineus has ducked behind cover, and it kills someone else. This is the cue for open warfare, which in turn prompts Minerva to appear and guard Perseus with her shield. before me!” And he raised Medusa’s head. Perseus and Andromeda leave the palace filled with hundreds of statues, and return to Argos. There they find that Proetus has usurped power. He too feels the awesome power of Medusa’s gaze, as does another old enemy, Polydectes, the king of Seriphos. This extraordinary wedding brings to mind the battle between Odysseus and Penelope’s suitors, although this story concludes very differently because of Perseus’ use of Medusa’s head. Ovid’s account is uniquely detailed and explicit, drawing parallels with Virgil’s account of Aeneas’ battle with Turnus over Lavinia, in the Aeneid. Not as popular a subject in painting as Medusa or the rescue of Andromeda, Perseus’ wedding has still attracted some of the finest narrative painters prior to the nineteenth century, with the notable exception of Rubens. Annibale Carracci (1560-1609) and Domenichino (Domenico Zampieri) (1581-1641), Perseus and Phineas (1604-06), fresco, dimensions not known, Palazzo Farnese, Rome. Wikimedia Commons. Annibale Carracci and Domenichino combined their talents in painting this fresco of Perseus and Phineas (1604-06) in the Palazzo Farnese in Rome. As Perseus stands in the centre brandishing the Gorgon’s face towards his attackers, Andromeda and her parents shelter behind, shielding their eyes for safety. Luca Giordano (1632–1705), Perseus Turning Phineus and his Followers to Stone (c 1683), oil on canvas, 285 x 366 cm, The National Gallery (Bought, 1983), London. Courtesy of and © The National Gallery, London. 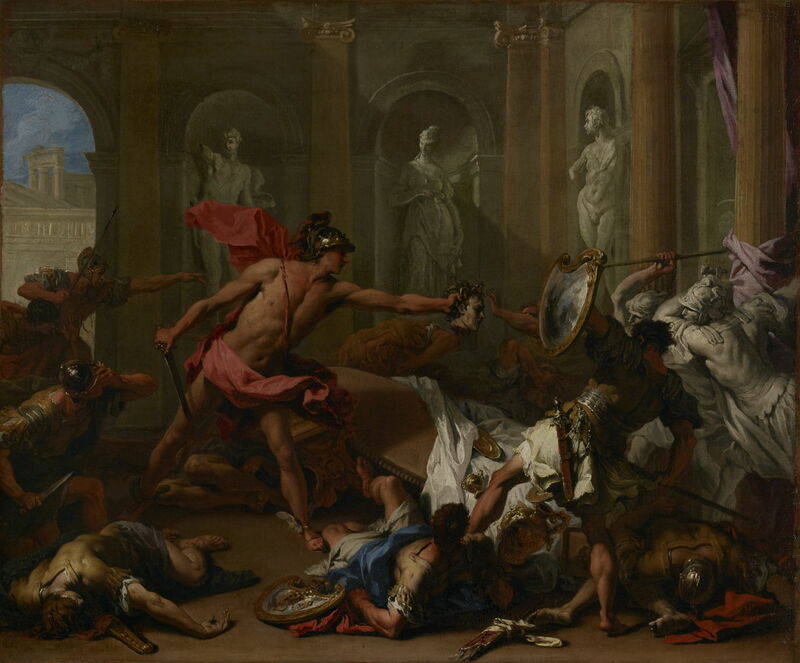 In Giordano’s Perseus Turning Phineus and his Followers to Stone (c 1683), the process of petrification is made less obvious, but the carnage and mayhem better-developed. Sebastiano Ricci (1659–1734), Perseus Confronting Phineus with the Head of Medusa (c 1705-10), oil on canvas, 64.1 × 77.2 cm, The J. Paul Getty Museum, Los Angeles, CA. Courtesy of J. Paul Getty Museum. 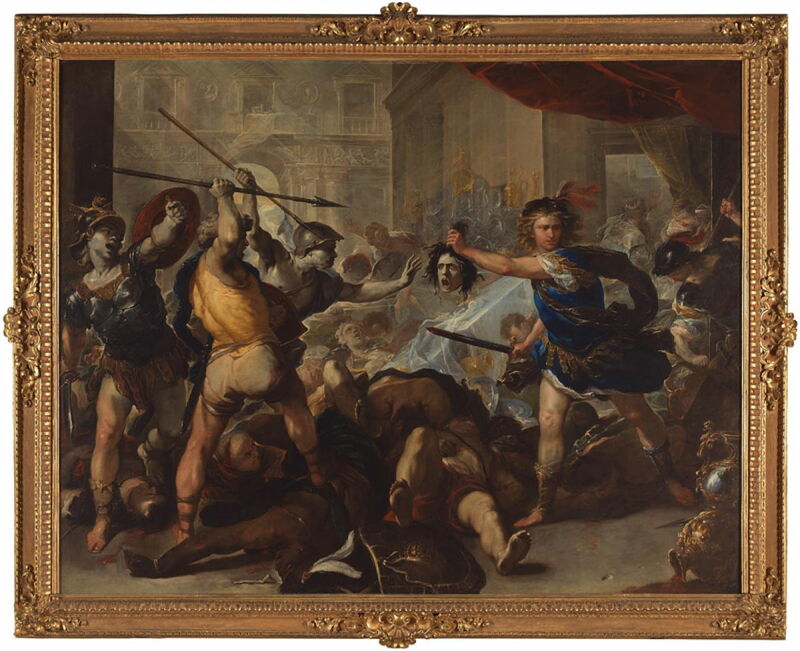 Ricci’s Perseus Confronting Phineus with the Head of Medusa (c 1705-10) also shows the final moments of the battle, as Phineus cowers next to two of his henchmen who have almost completed the process of changing into stone. 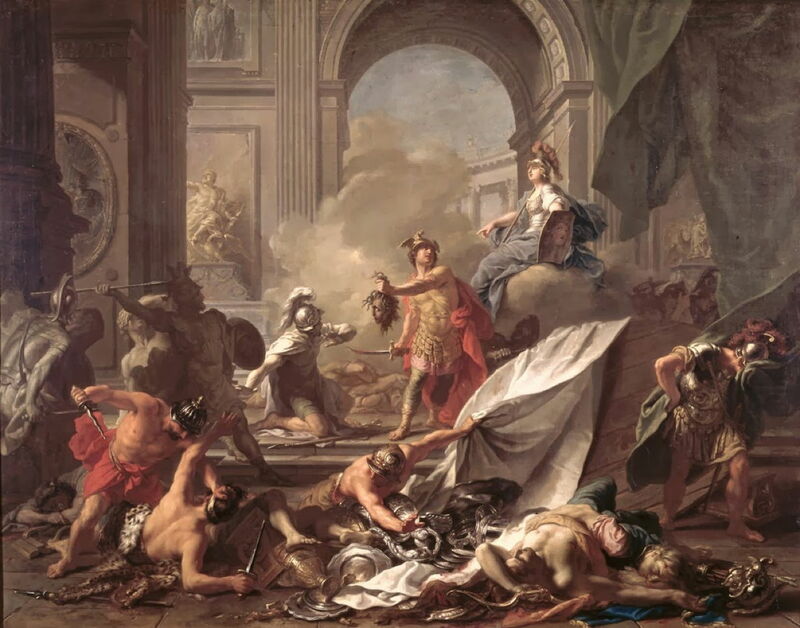 Suprisingly, none of those paintings made any clear reference to Minerva’s protection of Perseus, which is clearly expressed in Jean-Marc Nattier’s undated painting of Perseus, Under the Protection of Minerva, Turns Phineus to Stone by Brandishing the Head of Medusa. The goddess, Perseus’ half-sister, is sat on a cloud to the right of and behind the hero. She wears her distinctive helmet, grips her spear, and her left hand holds her Aegis, a shield which bears the image of Medusa’s face – a relevant narrative closure here. Perseus points his weapons away from himself and Minerva, and is looking up towards the goddess. In the foreground, one of Phineus’ party seems to be sorting through the silverware, perhaps intending to make off it. This story seems to have vanished from the repertoire of narrative painting during the eighteenth century. Although Edward Burne-Jones worked on a drawing for his Perseus series, that never progressed any further, and I can find no trace of any painting of this wedding feast during the nineteenth century. Each of these paintings has captured the bloodshed and chaos brought to the wedding feast. I confess to having a particular liking for the last painting, Nattier’s, which is most complete in terms of the narrative, and has the boldest composition. Posted in General, Language, Life, Painting and tagged Carracci, Domenichino, Giordano, Metamorphoses, myth, narrative, Nattier, Ovid, painting, Perseus, Ricci. Bookmark the permalink.